Ever wonder how easy or hard it would be to perform your own sink drain installation? Something that might seem so intimidating to the average person is actually very attainable. To show you just how doable this project is and to take the mystery out of the mayhem, Dr.Pipe Drain and Plumbing Services in Hamilton will offer step by step instructions on how you can install or replace your own bathroom sink drain. Drain Kit: There are a few different types of drains, but for instructional purposes, let’s call this one a pop up drain kit. Pliers: Specifically, you will need the channel type variety. These pliers are about the size of a small to medium wrench and have a head that resembles a dinosaur opening and closing its mouth. Pipe Joint Compound: Make sure that the variety you use is compatible with the pipe material you are using. This substance is meant to lubricate and seal the pipe joints. Plumber’s Putty: This compound is used to create watertight seals around metal fastenings and other pipe connections. It’s pretty pliable and can be purchased in a tub or tape form for convenience. It would also be a good idea to lay down some type of drop cloth in case of spills or drops so you do not damage the floor’s surface. Note: All instructions can be used in a kitchen sink installation. Simply replace the type of drain kit you are using to one appropriately matched for the purpose at hand. 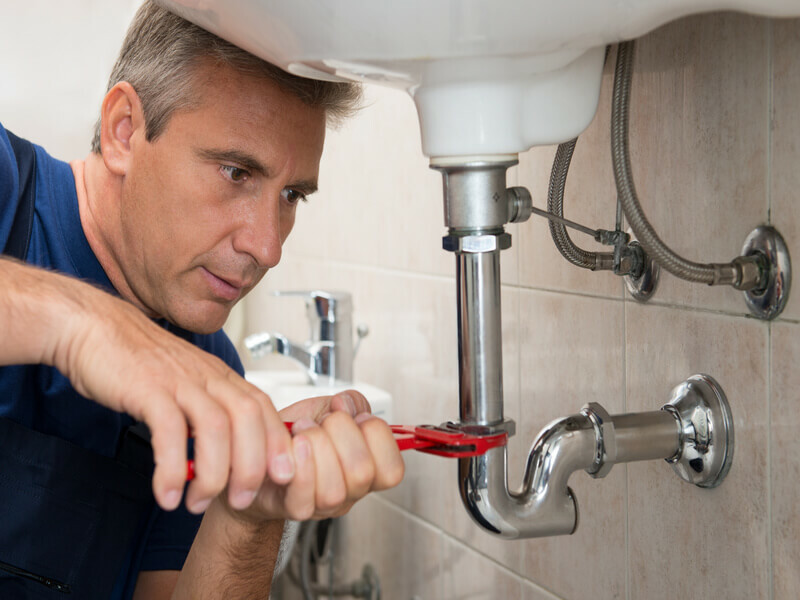 If you are installing the drain to a new sink, there isn’t much you need to do at this point, but if you are replacing an already existing drain, you need to remove the old one and clean out any residue as best you can. This can be done by using your pliers to unscrew the trap. One the trap is disconnected remove the old pop-up assembly. The pliers can be used again to remove the mounting nut from the old drain tailpiece; lift the drain assembly out of the sink. Now it’s time to take the pop up drain kit out of it’s box. Disassemble the entire unit, but be sure to lay it out in the arrangement of which it was assembled if you are not accustomed to identifying drain parts and their placement. It will make the entire process more straight forward. Make sure the mounting nut is unscrewed all the way down the drain tail pipe. There is a plastic and rubber washer that must be placed at the top of the mounting nut, make sure it is pushed down all the way. Apply a healthy amount of plumber’s joint compound on the rubber washer, this will help when fitting it to the connection piece. Since rubber creates a lot of friction, this lubricant will help the joint slide in. In the same step also apply the plumbers putty to the underside of the chrome ring that fits on the top side of the sink drain hole. Note: Some sinks cannot be used with plumber’s putty, silicone or even a foam or rubber gasket that comes with some of the kits. Now it is time to put everything together. Push the drain pipe up through the hole in the bottom of the sink. While you are holding this piece in place, place the chrome piece down over the pipe that came through the hole, putty side down. On the bottom drain piece below the sink, you need to screw the top ring into place, this can mostly be done by hand. Most importantly make sure the threads are straight when tightening the screw and don’t screw it too tightly. On the underside of the sink, hold the drain pipe and tighten the nut upwards. Make sure the the pop-up nut is facing straight back towards the wall. Using your pliers, make sure the nut is tightened to the point of not being able to easily jostle it from side to side, but do not over do it! The stopper installation will vary a bit depending on the type of sink hardware you have, so follow the instructions included in the kit carefully. Once the stopper is installed and integrated with the faucet hardware, you are good to go! Be diligent in your project and avoid making some common mistakes. Do use your sealants sparingly, always use a generous amount. You can always wipe the excess away, but once the connections are engaged, it’s hard to add more substance. Also, do not over tighten connections, besides stripping the threads, you are only going to make yours or your plumber’s job harder if it needs to be repaired or replaced in the future. Should think process still seem too much for you to handle, feel free to contact your local Hamilton plumbing specialists. Contact Dr.Pipe Drain and Plumbing Services in Hamilton calling 416-663-4777.